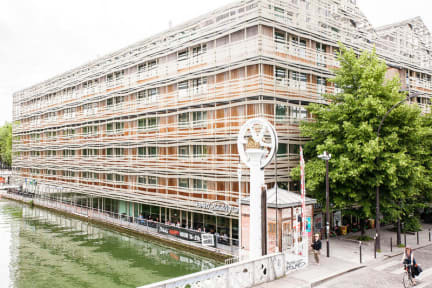 The hostel is really well located in a cool neighbourhood called la Villette. The hostel and the staff were amazing. Its easy too meet new people there is a metrostation close by what makes it easy to travel too the city or wherever you want to go. I really recommend this hostel! Had an amazing stay! All the staff is so helpfull and friendly and really made sure I had the best time! Special shout out to Femke, Camille & Carolina! I will definitely stay here again. Thank you so much! Amazing staff and atmoshpere! Metro stations are near by and there is always something to do at the canal. Femke, Florine, Robin and Merel are the best receptionists and Iris and Sharon are always happy behind the bar and helpful! Defenitely would recommend this place! The apero is amazing as well to meet new people!!!! Very nice hostel. Definitely a plus that they have their own bar. I loved the activities the hostel arranged! Will surely stay here again. Great & clean hostel. Would stay here again!